We are deep into my favourite time of the year - autumn, and this could not be a better time to highlight another classic Fall recipe, butternut squash soup. This time though, before I jump into the recipe, I want to mention a once forgotten herb that is now slowly, but surely, making its way back into our culinary language. This herb will perk up that butternut squash soup and make it sing. And the name of this wonderful herb? 'Lovage'. Oh lovage, what a fab name that I swear should be on the tips of everyones lips. 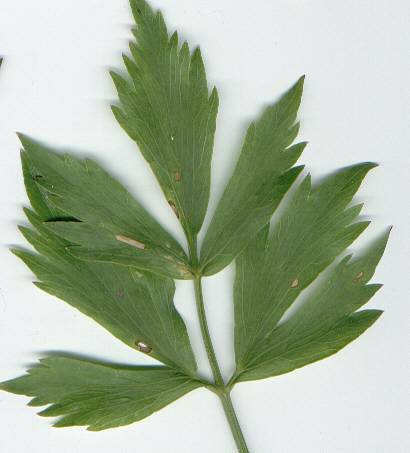 It looks a little like flat leaf parsley or cilantro, and shares a palate similar to curry. A truly fabulous flavour. Whenever I hear or see the word lovage, I am reminded of that classic Seinfeld episode where Jerry talks about salsa, its popularity and why people like to say the word salsa. Except, in this case lets substitute 'salsa' with 'lovage'. Where is the lovage? I'd like some lovage. Gimme some lovage. Anyway, you get the point. This tasty herb is not only pleasing to say, but has a variety of uses besides perking up a simnple soup recipe. Several researches have shown that lovage is an extremely beneficial herb for the digestive and respiratory systems. It has warming and stimulating therapeutic effects on both. In addition, lovage is effectual in healing ailments such as poor appetite, indigestion, bronchitis, gas and colic (pain in the abdomen). Lovage also possesses considerable diuretic and antimicrobial properties and hence it is normally administered for healing urinary tract problems. Don't you just smile at the more you know? Who knew that a simple herb could have so many amazing healthy benefits? Well think about that the next time your browsing your grocery aisles for garnishes. And in if you do happen to come across lovage, try it with this classic butternut squash soup recipe! Preparation: Heat over to 400 degrees. Half the squash and remove the seeds. Mix together the curry sugar and il, and pour into the cavity of each squash. Bake for 45 minutes. Remove from oven, and peel off skin. Chop squash into pieces. In a medium or large saucepan, bring the stock to a boil. Add in squash and onion, and reduce heat to simmer. If available, use a hand held immersion blender directly in the soup to blend ingredients together. If an immersion blender is unavailable, transfer soup into blender and mix. Once this is done, pour soup back into saucepan, heat it up but do not let it come to a boil, and add in the coconut milk. Add in salt and pepper to taste. Garnish soup with lovage and serve.